Enzyme assay kits are convenient ways to measure certain constitutents of cheese (e.g., lactose, D/L-lactate or citrate). 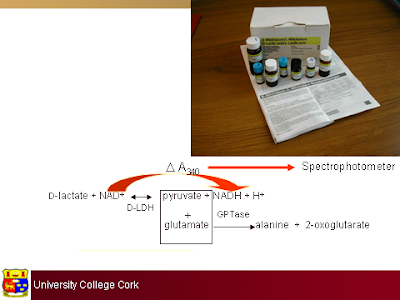 The the example shown below, D-lactate is determined by using D-lactate dehydrogenase which catalyses the conversion of D-lactate to pyruvate and NAD+ to NADH. This reaction does not naturally go to completion so a second enzyme, glutamate-pyruvate transaminase, which reacts pyruvate and glutamate, is used to pull the first reaction to completion. The conversion of NAD+ to NADH is measured spectrophotometrically as the oxidized and reduced form of this co-factor absorb differently at 340 nm. Enzyme assay kits are quick and convenient as all reagents necessary come with the kit. However, their use can be expensive for large number of samples and the kits cannot be stored for long periods of time without loss of enzyme activity.